Remember those yarns I was going to cull but looked good together? Well I did weave something out of them: a shawl. It was very lazy weaving. I wound the warp with six threads held together. The heathery purple broke so I knew it would never survive being a warp. It was moth-eaten, and the holes went deep, so it went in the trash. So I unwound and replaced it with a fine green and a blue yarn from the stash. 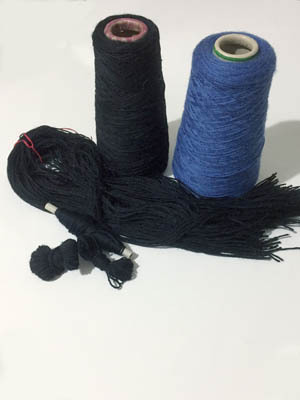 Initially, I thought I might treat each bunch of seven threads as one. I didn’t have set ideas, though. The wpi was 6epi, and I thought that might be too large for the heddles. The possibility of weaving a goose-eye twill had me reconsidering, too. My reed is 10epi. If I divided the seven threads in half I could put one half in each dent. Would that make too sleazy a fabric? I wouldn’t know until I tried it. I figured I could alway rethread the reed. It turned out that the sett was a bit too dense, so I spaced it out to 0,1,1,1. 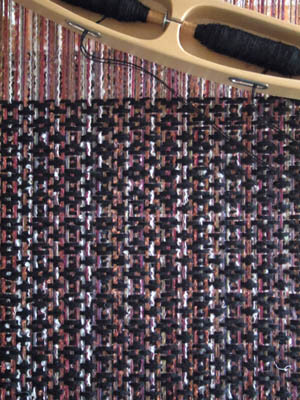 Then I tied on and began weaving, using a thin black yarn doubled on a two-pirn shuttle so the weft was 4 strands thick. This came close enough to a balanced weave to show the goose-eye pattern well. Of course, I then had to put yarn back in the stash. It would have been too much of a coincidence if all these leftover cones had the same quantity of yarn on them and I used them all up at the same time. But I only put about 200 grams back, and with the warp for the Fancy Log Cabin Blanket being wound the stash was still well below 35 kilos. 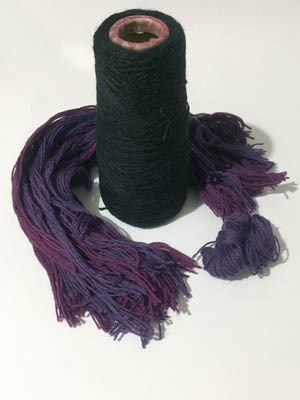 The yarn used in this project had been knitted, stained accidentally by being spun dry with another garment that lost colour, overdyed to hide the stain – which partially fulled and shrank it, then frogged. 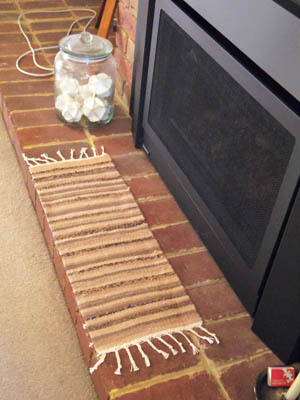 Honestly, I was close to tossing it in my stash cull, but then I remembered that I wanted to make a mat for the brick edge in front of the heater, which is in a nice position for warming oneself up but rather cold on the posterior. It seemed like a good opportunity to try out flat panel knitting on Chew-bacca. I set up the machine and started. The balls of yarn are made up of short lengths knotted together. After four tries to get a panel cranking I gave up. The furthest I got before stitches started dropping was about ten rows. No idea why, but I suspect the yarn is to blame. Having to take the yarn out of the guide to let the knots through was probably creating inconsistent tension. I nearly tossed the yarn out, then and there, but I still had the option of weaving it instead. I wanted a thick fabric, however. 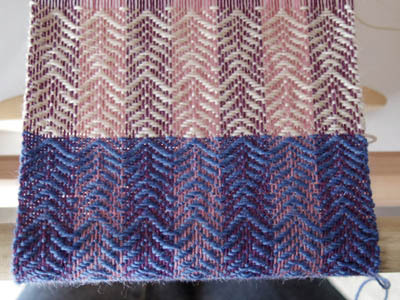 When I remembered that I had a batch of long rug warp left over from an earlier project the answer came to me: beating hard to make a weft-faced fabric. Which I’m ambivalent about, to tell the truth. It does what it was meant to, but I don’t think it’s particularly attractive. The cat likes it, or at least he likes the fire and the mat makes the bricks less cold to sit on. I only used up half the yarn and since I had no great wish to weave another mat from it, or anything to be honest, I tossed the rest. At least it’s a natural fibre, and will decompose. And it got the stash total down a little more. 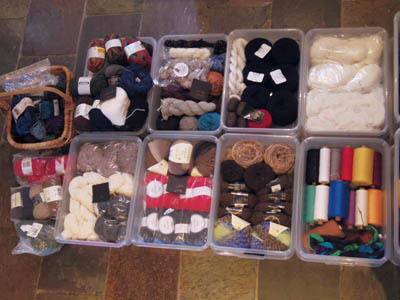 While I was waiting for the Addi knitting machines to arrive I looked in my stash for yarns suitable to knit on them. I found seventeen batches of 8 or 10 ply wool or alpaca yarn, half of which I bought in the last year or two. I didn’t count the Bendigo cotton 8ply since, when I gave it a try on a machine, it was a little thin – a 10ply cotton would be better. Of these seventeen yarns, none were in batches large enough to make a garment. I could combine some, as I’d done with the Green Lines Jacket, but even then I wouldn’t have enough to make anything larger than a vest – and I already have plenty of those. So what to do? Well, I’m intending to go to the Bendy Show this year. There’s no fun in going but not buying anything. 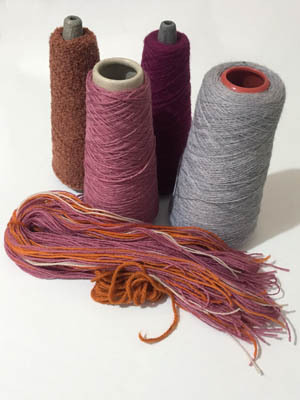 Perhaps garment-sized batches of yarn in weights to use on the circular machines could be something to keep an eye out for. After all, making the Green Lines Jacket and the pieces of another garment must have given me some room in the stash, right? It seems my stash has got a little out of control again. A few years back I got it down to ten kilos. Is now four times that weight. I’ve been storing cones and packets of yarn on top of cupboards and squeezed in with my sewing machines. How did it grow so much so quickly? To work it out, I dragged all the cone yarn into the kitchen because there did seem to be a LOT of it. Sure enough, I had enough to cover our 8-seater dining table. Most of it I’ve picked up for a bargain or from other people’s stash bust. I’ve not been setting out to buy cone yarn, just accumulating whatever came along. Over the next night I thought about what I had. Some of the yarn is good, some of it okay, some not so great. Life is too short to work with yarn you don’t like. I considered what I could make with it, whether for me or for someone else or for charity. Later I remembered the third way to look at it: what could I learn while using it? So the next day I brought the rest of my stash out. 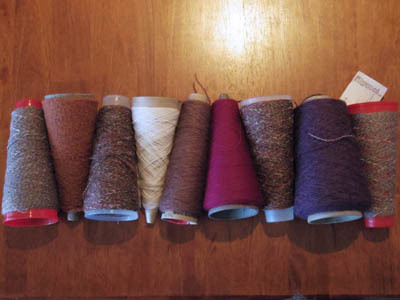 I divided it first into cones and skeins/balls, then by fibre type, then by weight, then by purpose (eg. 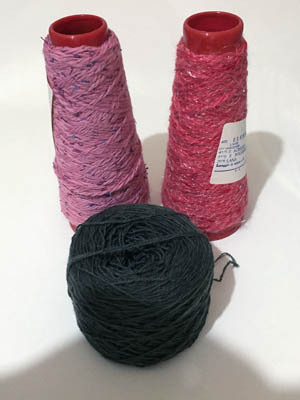 sock yarn). My stash is supposed to fill only the 16 tubs I have. They come in two sizes, and I decided to put most of the cones into the larger and most of the skein/balls into the smaller. Then I wrote two lists for each tub: one of potential projects, one of what I could learn making them. 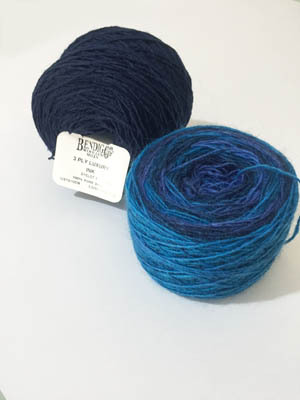 All through this I culled yarn that I either didn’t like, or the project I had in mind didn’t thrill me (usually because it’s only purpose was to use up the yarn) and nothing else came to mind. I removed about one large tub’s worth of yarn overall. Of course, it always turns out that some of the culled yarns look great together. Despite all this, I still couldn’t fit all my stash into the tubs. The problem wasn’t cones, but skeins/balls. To solve that I took a few batches out to knit up straight away on the circular knitting machines, which left me with only sock yarn ‘scraps’ not fitting. Can you see room for new yarn? Me neither. Time to get serious. I was going to have to cull harder, knit/weave really fast for the next month, or not buy anything at the Bendy Show. Since the latter was inconceivable, that left the first two. After updating my stash spreadsheet the total was down to around 36 kilos. I decided it needed to get down to 35 kilos before I was allowed to buy more yarn. I culled what I considered a bad purchase (went to a friend knitting charity blanket squares) then warped up the knitters loom with another yarn. Still 600 grams over. Then I remembered that cotton is heavier than wool, so I started winding a warp for a baby blanket. Stash total = 34719 grams! Yessss! I’ve since removed another 400 grams for a machine knit blanket. I reckon I have one small tub’s worth of space free, which isn’t a lot. Still, the stash is well organised now. And I have plans for most of it. All I need now is inspiration and time. And maybe a ban on accumulating bargain or free cones of yarn for a while. The yarns I’d dyed seemed to take a loooong time to dry. 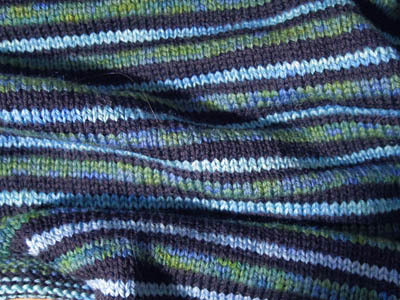 The blue-green yarn was dry by the following weekend, thankfully, so I started the project it was for. 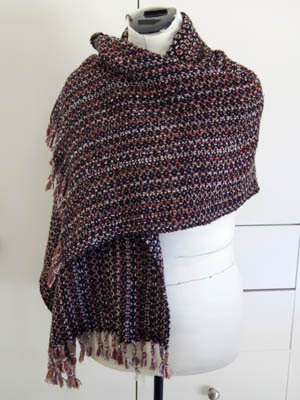 The pattern I’d settled on was the Garter Wrap Jacket from Bendigo Woollen Mills, which a weaver had shown the Weaving Matters group a few gatherings ago as a design it might be possible to make on the loom. The jacket is a big rectangle with two slits on each side. It’s knit from the long side up. Even with a double-width Bond I didn’t have enough needles for it, so I turned the rectangle 90 degrees. I made the arm slits a bit longer than on the pattern because it’s easier to sew them up than to cut them longer. 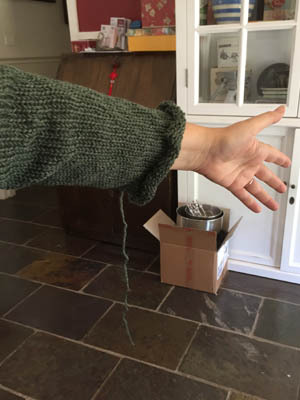 And, well, I do have longer arms than the usual knitting pattern in my size allows for. That meant I needed to knit three sections, join them to knit the middle section, then separate and knit three more sections. At the same time, I had to combine three colours of yarn in a pattern that would use them all up at the same rate. I weighed the yarns and worked out the row sequence would have to be: 2 light green, 2 black, 3 dark green, 3 black, with some extra black allowed for some ribbing for the sleeves. It wasn’t hard to memorise the row sequence, but it was fiddly to keep swapping the yarns around so it took many, many more hours to knit than I’d expected. Still, the result looks fabulous. The next part is sewing in all the ends. This is taking quite a while. Cranky – in a Good Way! Much giggling was had. Then I put the machine away and mostly forgot about it as I was swept up in sewing with handwoven fabric. 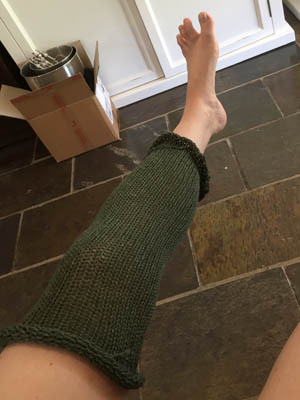 But the other day, while I was waiting for my dyed yarn to dry, I figured it would be a way to scratch the machine knitting itch. 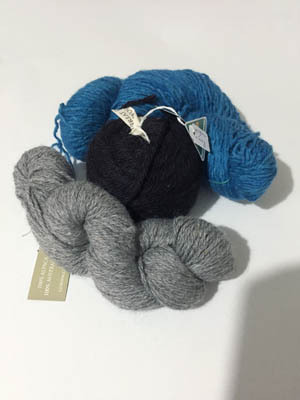 I dug out some skeins of beautifully soft alpaca yarn I bought a little over year ago in Canberra. And I got cranking. 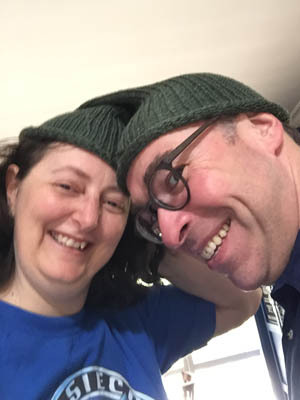 However, this second tube confirmed my suspicion that the machine was the right size to make small children’s hats, not adult ones. I could get the tube onto my head, but it was really too stretched out to make a comfy, attractive hat. 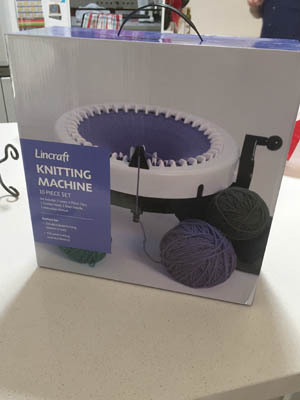 I decided I would knit a hat on the Bond instead and use the rest of the yarn to crank out a plain scarf on the Lincraft machine. 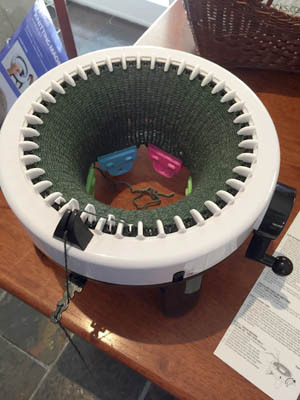 But just in case I was doing something wrong on the machine, I looked up circular knitting machines on Ravelry and did a quick google. Next thing I knew I’d lost an hour or two in YouTube. I learned that there was a version of the machine I’d bought released in the US that was pink and white, and that it was rather good for the price. The Addi King was the best, however, and the right size for adult hats. So I googled and it came up in Amazon for over A$600. WTF!!! Some more searching and I found it for half of that on eBay. Then I found a shop in Germany selling the machines for a far more reasonable price… and a $90 shipping fee! So high postage costs partly explained the crazy prices I was seeing – if it was travelling to the US and then to Australia the costs would be astronomical. Direct from Germany was better, and the price came down considerably if you shipped two machines – the small Pro and larger King model. I did think about it for a little while before I succumbed to temptation. Now I just have to wait for them to arrive. A few weeks ago I was feeling poorly, so for something to do I backed up this blog. Well, not in the usual way. Looking at the backups WordPress does, I couldn’t see how I would ever access the entries if I ever needed just the contents. So I cut and paste the contents of every month into a Word document – which is how I used to back up when this was a Blogger blog. When I was done I skim read through the blog from the start. That was… interesting. It’s easy to feel like I am some kind of crazy person obsessed with making stuff when I read an entire year’s entries in one sitting! 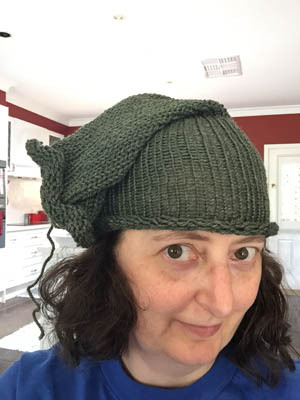 The blog has seen lots of changes, from RSI forcing me to give up knitting to passing phases of craft-related internet phenomenon (blogs, podcasts, ravelry, pinterest). It put me in a strange, fed-up mood, so that once I had a little energy again I began tidying up and finishing things. The Taupe Jacket lining got sewn so I could put the machines away. Materials I’d gathered for a talk at the Guild that was cancelled got packed away as I was sick of them taking up space waiting to see if it would be rescheduled. I finished spinning the banana fibre after not touching the wheel for many months, to see if I should pack the wheel away. I decided this mood might be good for culling so I started halfheartedly tidying the craft room. I started with jewellery supplies, moved on to refashioning projects and finally tackled the accumulation of carry bags around the house. In the middle of it I wound up in the garage, where I made the biggest impact – all the basketry materials I accumulated early last year went into the green waste bin. Other than that I didn’t get rid of much. Mostly I put stuff away or stored it better. While the result was satisfying, I suspect if I had more energy and time I could have done a lot more. I have the WIP list down to just three items now, but I’ll be starting a few weaving projects soon so that isn’t going to last long! Some weeks back when I warped up pretty much every loom I own, I put a simple 3ply wool warp on the Knitters Loom and gathered together thrums and yarns in pink, cream, brown and burgundy. 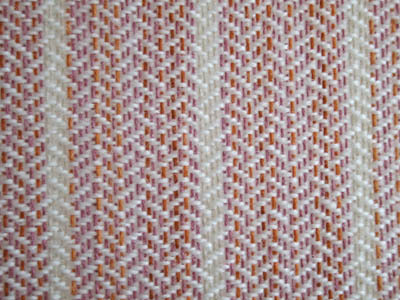 I was inspired by Saori weaving, and hoped that a simple project would be within my abilities post-eye surgery. As it turned out, I had so much fun that I wove a fair bit of the warp before the surgery happened. After the op I didn’t weave for a few days, but I put the loom near by tv-watching armchair and eventually I gave it a go. 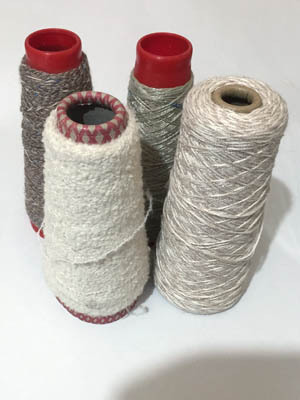 I had a thick cream cotton, three strands of very fine grey, burgundy and yellow-brown boucle wound together, and some handspun to play with along with the thrums. 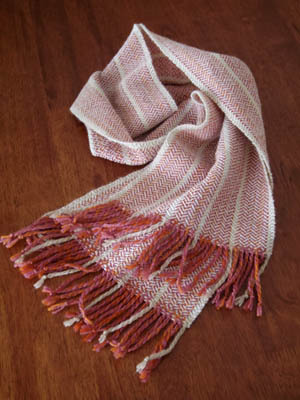 I also used the warp yarns – using up the pink with plain weave sections between each bit of ‘play’. 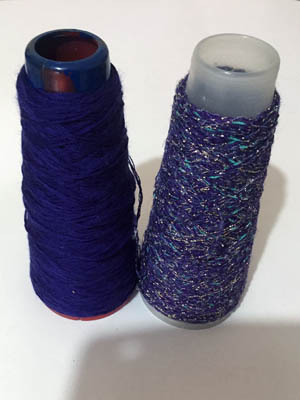 Initially I played with using the thrums and seeing how the different yarns wove up. 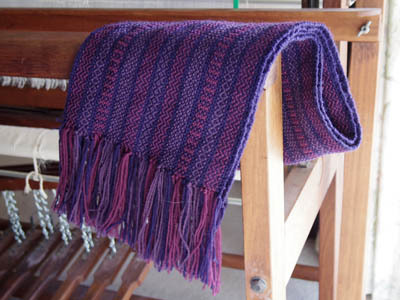 I also went through most of the weaving methods on a rigid heddle I’d tried before. Clasped weft, basketweave, thick and thin, rya knots, tapestry, danish medallions, leno and Brook’s bouquet had a turn. Then I began to mix the techiniques. I used a pickup stick to weave plain weave with half the warp as a background for Brook’s bouquet. I wove leno as the same time weaving another yarn over and under the leno twists. I had so much fun! I didn’t think much about what the fabric would be. I figured probably not a scarf, as it would be one-sided and maybe a bit lumpy in places, and not have an overall even appearance. But when I took it off the loom, I was surprised to find it does make a nice scarf. All the different kinds of weaving hang together well, and the textural elements haven’t stiffened it up or made it overly lumpy. The colours are not what I usually wear, so I’m thinking I might sell or give it away. But I will take lots of photos, because I came up with some combinations of techniques that I’d like to use in other projects. Also, I had a birthday recently and received an Ashford Vari Dent reed, and I have an idea I want to try with it. But first, I have three other weaving projects wanting my attention. I want to get at least one of them done before I warp up another one. I’m definitely experiencing the ‘fidget’ part of my blog title! The skirt fabric is off the loom, washed and draped over my dress model, waiting to be pinned and shaped into something hopefully wearable. 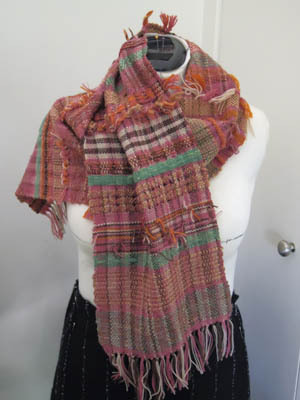 The falling feathers scarf is half woven. 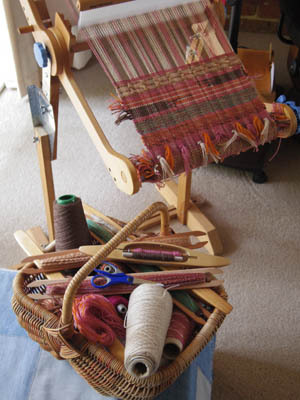 The 4 shaft table loom is now on a folding table in the entertainment room with a pile of carpet warp and yarn awaiting transformation into a krokbragd rug. 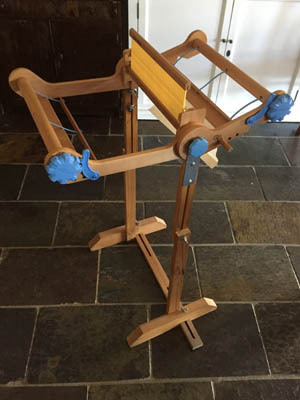 The Knitters Loom now has a stand! 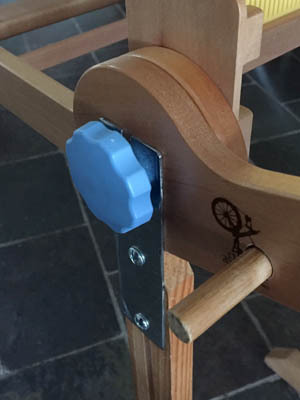 It’s an embroidery stretcher stand, and all it needed to transform into a loom stand was for Paul to make two flat pieces of metal for the side knobs of the loom to slot into. But what to put on it, and the floor loom? On Sunday I was feeling a bit under the weather and didn’t want anything mentally challenging to do. Over the previous week I’d been thinking a lot about saori weaving and how Amanda weaves thrums from previous projects into new pieces. So I dug out my bag of thrums and began considering what I could make with them. First I separated them into cotton or wool. Most were in bundles according to the project they’d come from. I put all the 8/2 cotton thrums together and decided they would be used at warp ties. 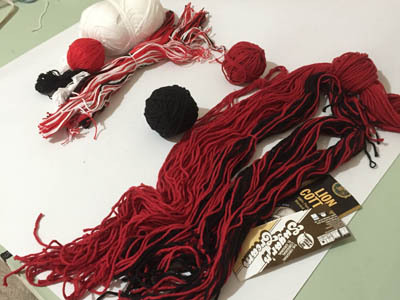 There are three batches of red, white and black cotton from hand towel and tea towel projects. All using different thicknesses of yarn. The 8/2 cotton went into the warp tie bag, which left me with 3ply and 10ply. I decided to make dishcloths, which I use rather than plastic sponges or ‘chux’ in the kitchen. They can be thrown in the wash and once worn out are biodegradable. I’ll try weaving the 10ply on my pin loom, and I’ll warp up the Knitters loom with some white 4ply cotton for weaving the 3ply thrums. They’ll be fringed on all sides, and I’ll have to either hemstitch or zigzag around them for stability. Of the wool thrums, I have two batches of purple. One is quite short, but the other is long enough, and there’s enough of it, to become a side fringe on a clasped weft scarf. My newest batch of thrums comes from the skirt fabric. All black. So when I warp up the purple thrum fringe project I’m going to add enough to do a second one with blue on the non-fringe side. Looking for yarns to go with the thrums from the plaited twill scarf, I pulled out several cones. 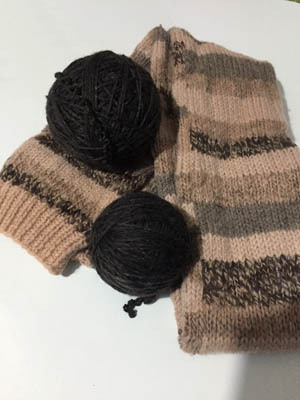 The grey and burgundy yarns below are very thin, but put together, with the rust coloured boucle yarn, they’ll be thick enough to weave without the risk of expiring of boredom. 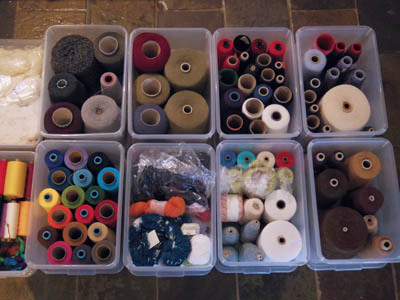 By now I’d found uses for most of the thrums and was enjoying mixing and matching stash. I already knew I had a potential combination between the two new white/taupe yarns and the darker taupe-ish ones already in my stash, and the mix was one I’d been having saori-like daydreams about. The next combo had popped into my head during a bout of insomnia. Pink and green. Watermelon colours. I’ve got lots of the green, so perhaps a shawl. This new purple matches perfectly with the glitzy one in my stash. 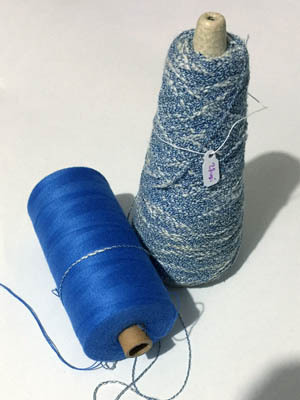 Plans for making clothing have had me thinking about combining the slubby blue cotton with white and making a top, but on a whim I put it with blue and it works much better. By this point I’d started tidying the stash. 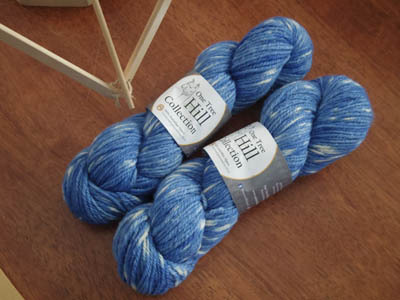 The blue alpaca below was from a scarf I frogged, and I’d just stuffed it in a box with yarns of similar thickness. Now I moved it to the ‘yarns other than cotton, wool or acrylic’ box and discovered I had a lovely combo of alpaca 8ply yarn. So soft! I spend most of the day mixing and matching, brainstorming, winding yarn and resorting stash. It was a lovely way to spend a Sunday. It means I have an even longer to-do list of projects I want to tackle right away, though. 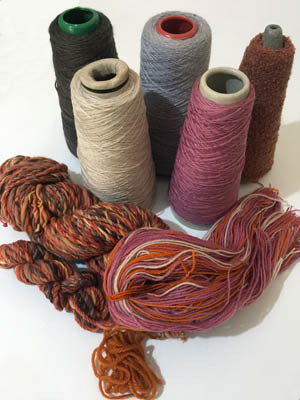 Some of these might never happen – I’ll change my mind about a combo or find a better use for a yarn – but coming up with ideas is half the fun. 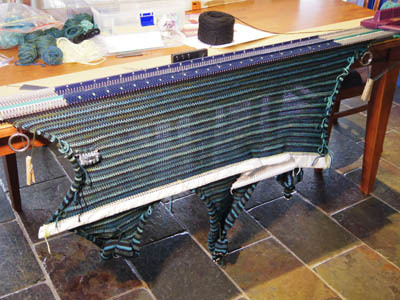 The next challenge is to choose weave structures, drafts and looms for them – and decide which one to start next. The dishcloths are going on the Knitters Loom first. That much, I know! This was yet another leftovers-using project, this time to use up the orange yarn I dyed for the overshot sampler I did last year. These batches picked up black dye from the pot I had used previously in a failed attempt to dye some stained polyester pants. I couldn’t scrub the residue off the pot, yet it came off on the yarn as a greyish shadow. The pot went into the rubbish afterwards, which was a shame, as it was a good sized dying pot. Since the shadowing wasn’t uniform, I mixed the orange threads among twice as many in the ‘dusky rose’ colour of in the same yarn. I’ve been liking the dividing stripe effect of the last few scarves I’ve woven, so I added some in ‘raffia’ too. Then I chose ‘almond’, a slightly off-white, for the weft. It was MUCH easier to warp the loom this time as I wasn’t working with already cut ends and therefore no cross. 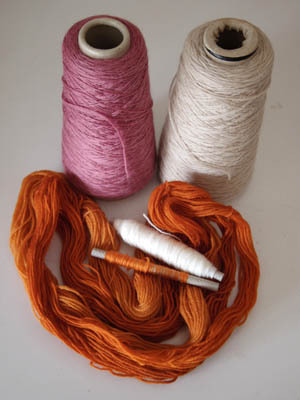 I could use my warping board to wind and tie everything neatly, with one exception: because I wanted to mix the orange with the pink I wound three threads together – one orange and two pink – and that meant the cross wasn’t of alternate single threads but sets of three. This allowed me to move the orange thread of each trio around when threading so the mix was more random than simply orange-pink-pink and I didn’t get two orange threads next to each other. Like with the Scarf of Leftover Colours, having eight pedals meant I could arrange the tie up so I could simply move from left to right. Then I got weaving. Oh my. I may have fallen in love with plaited twill. It’s so pretty! These are not my usual wearing colours. Either I’m going to have to revise that opinion, find someone dear to me who does wear them, or weave another plaited twill scarf. I’m thinking the latter. I have other plans for the floor loom’s next project, so that’ll have to wait. On the Katie, I put another leftovers warp on, using up some burgundy warp. I found a draft I liked by entering “weaving drafts” in google images. I started with a blue weft, but didn’t like it, so I tried cream and it’s much better. However, it wasn’t looking like it was supposed to. I realised I was making several mistakes: I should be working from the bottom to the top, the black squares for the tie up should be for shafts in the down position and not up, and I had missed four picks of the sequence in each repeat. But I liked what I’d done, so I just made a new draft that looked like the result I had and called it ‘falling feathers’. The other mistake I made was that, when I measured the warp, I cut sixteen threads for each stripe, when the pattern repeat actually uses 14. So now I have another small pile of leftover warp to use up. I just need to settle on a draft to weave.